This falls under “why didn’t I think of that!” Just click this clip to the edge of a laptop and have your phone secured on the other side for easy access to your phone that is used to work together with your laptop. It makes it more convenient to video chat with someone while your laptop is occupied with other tasks. Colors: Black, Lime Green, Red, Royal Blue or White. Price includes one standard imprint color in one location. 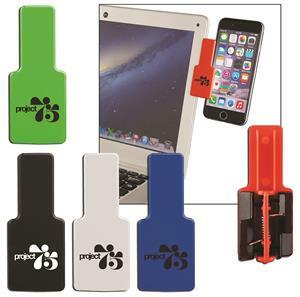 Logos: Add a set-up charge of $55.00 on new orders; $25.00 on re-orders. For quantities of 5000+ pcs, please call 1-800-343-5978 for pricing. Standard production time is 5-7 working days. 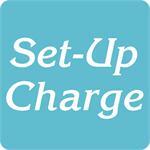 For orders that require a set-up charge of $55.00.